Why do people make bold predictions of doom? 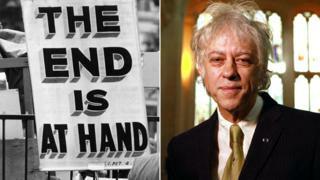 Bob Geldof has said the human race might have as little as 17 more years before "a mass extinction event". Why do people make such bold predictions of doom, asks Ben Milne. The End is Nigh - it's a simple message, and it gets the attention (if not necessarily the belief) of the passer-by. But Live Aid organiser Geldof - who made his remark at a youth summit in South Africa - is not the first person to walk the streets with this sandwich board. In fact, predicting the end of the world may be one of its inhabitants' oldest pastimes. It's only a matter of months since the ancient Mayan "prophecy" of 21 December 2012 passed without event. The world - and last-minute Christmas shopping - continued uninterrupted. Religions are particularly prone to this sort of prediction. In Matthew's gospel, Jesus talks of the "return of the Son of Man", and says "but of that day and hour knoweth no man, no, not the angels of heaven, but my Father only". It's a line which has proved too tempting for second-guessing believers ever since. Jehovah's Witnesses have been accused of having made predictions for 1878, 1881, 1914, 1918, 1925, and 1975 as dates for Judgement Day. The US radio evangelist Harold Camping built up a ministry worth millions of dollars predicting that 21 May 2011 would be the big one. Camping later admitted he was probably mistaken, and donations to his ministry suffered an apocalyptic fall themselves. But in this age of nuclear power and climate change warnings, end-of-days predictions come from all manner of sources. Independent scientist James Lovelock made apocalyptic warnings about the climate in 2006, saying that by the end of the 21st Century, billions of people would be wiped out, and the Arctic would be one of the few places remaining habitable. He later said he might have been "alarmist". Myles Allen, who's professor of geosystem science at Oxford University, says that "competing hyperbole" is not helpful for actually understanding climate change. "People talk up the rate of climate change in reaction to other people blatantly talking down the problem... which is why we don't make an advance on policy."